Storing an amount of extra water and food to be prepared for 1-week is smart and cheap preparedness insurance for many of the “most likely to happen” disruptions that you may encounter one day. You may be surprised that the majority of Americans apparently do not have a solid 1-week supply of food at home, and most certainly don’t have a 1-week supply of stored water either. The assumption is that the faucet will always deliver clean drinking water and the grocery store will always be open and accessible. Unfortunately this normalcy bias has helped keep the notion of preparedness out of the mainstream consciousness. While having a supply of food and water to last 1-week will not cover all hypothetical disruptions, it will set you off in the right direction to be prepared for many of today’s typical disruptive events within “Prepping and Preparedness 1” and hopefully eventually moving you towards “Prepping and Preparedness 2”. It is a near medical certainty that you will not survive without any water much beyond 3-days. That said, water is plentiful for most of us and not much of a thought is given towards securing some extra. It’s always available at your faucet tap, right? How or why might your water supply be disrupted? Contamination of the water supply. We hear about this every year somewhere in the country. I recall quite a number of times hearing on the news how residents of one town or another (or entire local regions) have been told not to drink the water, or to boil it first due to some type of contamination. Construction accidents may rip into a water main and contaminate the water. Flooding can cause infrastructure damage and contamination. There are other scenarios too which could temporarily interrupt your source of safe water. How soon before the local grocery stores are sold out of water during “an event”? Since this segment is focused only on minor disruptions lasting from just a day, days, up to possibly 1-week, I’m going to stay on the light side for “Prepping and Preparedness 1”. The typical plastic bottled water contains about 16-ounces (2-cups). So about 4 per day, or 28 for 1-week. 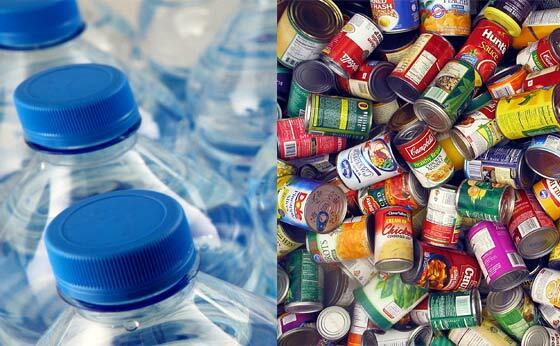 A typical case of bottled water has 24 bottles, so just call it a case per person for 1-week. Easy to handle 3.5 gallon stack-able water bricks from Water Brick. This is an easy discussion. Just buy more of it. Having 1-week of extra food in the house (per person!) is ridiculously easy. You just need to do it. How to know how much food will last 1-week? It’s all about calories. A general guideline is to have 2,000 calories of food per day per person. So when you’re buying this extra food you will need to look at the package, can, etc.. to determine how many calories are in there. I’m saying this just so that you won’t short yourself by overlooking the calories. Some of you can simply “eyeball it” and be close enough to figure a week’s worth of legitimate solid food storage. Just saying..
Avoid food that requires a freezer. When the power goes out, so will your freezer. For the purpose of emergency food storage, avoid food types that require lots of boiling water (pastas, etc..) because the electricity may be out (will your stove work?) and water will become a commodity not to be wasted until its over. Variety is a good thing. Instead of all the same food, buy a variety of foods. Canned foods are pretty ideal for this short-term purpose. Have a manual can opener? Get the foods that you like to eat. Keep it simple. For 1-week storage just go out and buy a case of water per person in the household, and go out and buy some more food! Remember to restock if you consume it! Water; “water water everywhere and not a drop to drink? “; The Rime of the Ancient Mariner,” by Samuel Taylor Coleridge. I have seen this personally in the past year; OUR lovely EPA contaminated the Animas River by opening a sealed off mine in the Rocky Mountains. The entire river was literally Orange and contaminated, for miles and miles (including 4 towns), this took quite awhile to clear up. One day into the debacle like a fool I dropped by the local Safeway Store to grab something and observed 3 Pickup Trucks loading case after case of bottled water. There were also 3 Semi’s parked in the Lot full of water. I just stood there in dismay shaking my head. I did happen to ask one of the men loading the water “Where do you live”? His reply “Over in Bloomfield”, I just laughed and told him “You do realize your water comes from a different river and aquifer”? He did not have a clue what I meant. FYI, Bottled water in Safeway, 2 cases (24 per case) for $5.oo, on sale at times for $1.88 each case. For less that $4.00 ya can have 2 cases just sitting there. Cheap Insurance. The rest of the water, get some used 5-gallon buckets with lids, add a few drops of Bleach and it’s good to go for months and months. Food; I know y-all get tired of me saying it; “Use one, Buy two” especially, like Ken said, non-perishable foods. The other thing, for one week, defiantly, “Store what you eat, Eat what you store” Ya don’t want to go into shock when you start eating Freeze Dried food if you have never even tried it before. There is another one since I’m on a roll, FIFO (First in, First out). Rotate your foods, a one week storage should not be a problem, but get into the habit. You are absolutely right though, Spam will keep for a minimum of 30-50 years…. HAHAHA So maybe Spam should wait for later articles? For some reason, Hawaiian’s love it, right Nailbanger? Locals do like it, its fairly affordable, easy to use for other stuff, most popular, SPAM musubi, is basically a cube of rice (sushi style) with a slice of spam wrapped in nori, easily portable and tasty if done right, I like making mine with the spam teriyaki. Then there’s just good old fried spam n eggs and rice, or for easy take with lunch, fried spam, with rice, I usually sprinkle my rice with furakake and a bit o soy sauce,,,, easy lunch. Have had it used in everything from WonTons to cooked into a quiche. I don’t really buy bottled water anymore,,, do buy Nalgene bottles though, use em all the time, big Berkey will make much better water out o the tap, so no sense in buying water. I will get into water filters in preparedness level-2. For the quick fix though for level-1, bottled water is cheap and quick insurance. I’ve lived through more than a dozen major hurricanes from Audrey in the 50’s to Katrina, Gustav and Isaac (most recent) and have lost power in every case from a day to six weeks but never lost gas or water service. Never-the-less, we always filled up containers of water in preparation for at least a weeks worth of water to drink for everyone in the household just in case. Just because we personally never lost water service during “grid down” events doesn’t mean it won’t happen the next time. Don’t let complacency set it. Fortunately, we don’t live in or around New Orleans but the poor souls who did live there during Katrina experienced first hand what happens in a total grid down situation. Water is necessary for life. Prepare accordingly. To NRP about garbage pickup… You are right about garbage pickup, thanks. I never thought about it as a major element because I have never lived in a city where I had to rely totally on someone else disposing of my garbage. In my area, if we went without garbage pickup for a month it would not be a big problem because a lot of people would simply burn it… at least in my case. Some of my neighbors already do that in the normal course of their existence. In the city, it would quickly become really nasty. We have dopes around here who don’t know what to do if there’s no trash pickup. Personally I would just dig a hole, anything not compostable would go in the hole. That stuff that leaves behind packaging etc would peter out after a while. One thing I have thought a lot about is smelting metals down to make other stuff, that’s a tough one. Blacksmithing metals like springs etc into other usable hardware is easier but most folks wouldn’t even think about it. Here on our rock we mine/produce, NOTHING! So wheres stuff like shovels and hoes come from? Tin cans have been saved and used for many things. Cans are great storage containers when the top lid is removed. Some tin cans are flattened out, then used as shingles for sheds and stuff. I’ve seen them used as siding, too — it’s a free building supply that has a ‘tramp art’ look. We separate our garbage out: recyclables (glass, plastics), cardboard/paper, fruit/veggie/grain ‘scraps’, grease, meat scraps, spent batteries, etc. Each of these items can be distributed elsewhere on our place or taken to the landfill a few times each year. If we didn’t have critters that would eat our food scraps, then we’d make a small compost pile to decompose the foods. As it is now, we have an enormous composting area since we have horses. I’ve never paid for ‘garbage removal’ in my life. It’s a strange concept. As is the way that people ‘giftwrap’ their garbage in expensive plastic bags and pay to have the garbage hauled away. I have never understood why anyone would pay good money for new bags just to contain garbage. It’s another one of those brainwashed ideas that people were sold on. Just reuse food bags: dog/cat food bags, feed-bags, or the bags and assorted packaging that come from mail-order items. All of these work great if you transfer garbage from the home to another location — and they’re free to re-use. Reusing bags for garbage is a good idea in areas where you have the freedom to do that. Unfortunately, in many towns and cities you are required to place your garbage in their purchased bags or buy stickers to put on the bags that you want picked up. Usually $2.00 to $3.00 per bag! Of course you still have the privilege of paying a garbage fee on your tax bill, along with the added per bag fee. We recycle, feed to the animals, burn, etc. Once you start thinking about how much you have to pay to dispose of it, most are more mindful of what they bring into their homes. And then there are those who will never care and just pay the piper. We have a garbage fee, and bins supplied by the city. One is “free” and if you need more you pay an additional fee. For me, bags are mainly for convenience in getting the stuff into the can. It’s intriguing to me to look up and down the street on garbage day and see two or three, sometimes four garbage cans and a single (mostly empty) recycle bin by each house. Sometimes we don’t even bother to put out the garbage. You bring up an excellent point. Even though you lost power you still had Water and Gas, the problem would be, is the water still “good” or contaminated? I still find it amazing that during Katrina when FEMA directed people to go to the Super Dome, it took 5 days to get water there…… And yes I know it was not just FEMA’s fault, bet really? Come-On-Man, 5 days for JUST water????? Our neighbor’s company sent him there with all their equipment to assist those stuck in the area. He said he would NEVER EVER go back into that area, the company could send someone else. The company had a laundry trucks, food services and this was for those who worked the area. The stories on the news were window dressing compared to what really happened. Those who wish to procrastinate on putting water & ready to eat supplies for their families because FEMA will save the day, you will have a VERY–VERY long wait. Or a VERY-VERY long dirt nap! I just finished as a Juror on a Criminal Fraud trial. Yet these are the same people that think exactly like you said. “.gov will save everyone”. Well I guess that’s true, this dude is taking a 3-6 year vacation in the State Pen on our dime for being as dumb as a rock. “If/when something does happen, I’m coming to your place” how many hundreds of times has that been said to others? Food and water are the easy ones. Its all those little things you don’t think about. I just had an ultrasound. No water after ten PM. By noon the next day when it was finished I was so thirsty. Fourteen hours without water and water was all I could think of. When I was rototilling the garden, pulling ‘tons’ of rocks out, and generally doing a lot of laborious work the other day, all I could think about was water too 😉 Fortunately I brought some with me! Most all of you have been there… (very thirsty), now imagine how bad it would get if you were not able to satisfy that thirst! Most take it for granted. Food; don’t forget the Spices, even for a week, food without the ‘usual’ spices gets nasty after a few days. More about Spices in the next series. I keep a lot of soy sauce, vinegars, pepper, and buckets of salt,,, plus have the usual stuff, Tabasco, ketchup etc. Here’s one you might like. The locals make what they call chilipepper water. Here’s another food folks scoff at, Ramen noodles, you know, the ones you can buy for 12$ for a case of 50ish at Costco. I gotta tell ya, if the world has gone to hellll in a hand basket, a nice big old hot bowl of noodles and broth is going to be really welcome. Thanks for the memories of Spam(also a musical skit by the Monty Python players). I bought some spam sushi from an Asian market for lunch during a rice run in San Jose, CA. My brother-in-law thought it was good and ran in the store to buy and eat more. Brought some home for my sister to try. Had to throw it out a week later as she absolutely refused to eat it. A can of Spam also makes great gag gifts for people from the Marshal Islands as they ate about as much Spam as the Hawaiians did. I like mine sliced and fried in sandwiches(everything is better when it is fried). Spam is part of my emergency food stash in that I normally do not eat it a lot but if times get tough, it fills my belly and provides meat and compliments the Ramen noodles and pork and beans in the emergency food stash/cache. As far as where tools come from, do you have a junkyard or salvage yard on your island? That which we do not have or can not buy, we make or refashioned from salvaged parts from junked cars, trucks or tractors. A big part of my job on the farms as a kid was to fix things and to keep things running(trucks, tractors stationary engines and motors). The one skill I never learned was how to weld metal. My guess is that you have a good selection of tools on hand as you obviously thought of the difficulty in obtaining more after SHTF. That’s the kinda crazy stuff I think of, if TSHTF we wont have ships bringing anything here. People are going to want rudimentary stuff. Canvas bags, canvas jackets, leather goods of all sorts, sturdy machetes and knives and garden tools. Garden tools are one thing most people overlook, most of the stuff available just falls apart if you really work it, hence my interest in heating metal up and beating it into some other shape. It’s funny though, people just don’t get it, when everything comes unglued and their weany hoe from the hardware store breaks they’ll be looking to buy one o my hand forged hoes with the peach handle. In the days after Katrina, Govt agencies were having so much trouble doing their job that many heads-of agencies lost their jobs after the loss of life and suffering around the city of New Orleans. There were bright spots that emerged from Private Industry: Waffle House Restaurants. Govt agencies developed the “Waffle House Index” to assess how badly an area was impacted as far as water, fuel and electrical service interuptions in geographic areas hit by a major storm. In many cases, Waffle House Restaurants were open within hours of a storm passing through. In the aftermath, when many Govt managers were fired, the corporate managers of Waffle house were recruited into slots to forward their ideas to Govt agencies. This story was covered by the Wall Street Journal proving that life can be stranger, funnier and more ironic than fiction. A little off subject, but very pertinent to the beginner preppers; the private owners and corp. owners of restaurants, many, MANY stores, bottled water suppliers and a LOT more were the FIRST on the scene. As a side note, a LOT of these private companies were run off by the Feds and FEMA. Hence do NOT depend on the .gov to be there for you if/when. Please start to prepare for yourselves by starting with the Water/Food as outlined in these articles. A few friends were talking about FEMA and how they had problems getting water to the Superdome after Katrina. I suggested that the SHEEPLE should have put in a two day delivery order to Amazon. Probably would have worked, ha, ha. Yes, that’s because I shut off the page-cache feature on the server a few days ago, given the many complaints. Sacrificing zippy speed, but it’s still not too bad in that regard. Better yet, with Amazon Prime there wouldn’t even have been a delivery fee! I just finished reading “Survival” written by a military commander involved in Katrina. He states that 1) A Culture of Preparedness should be advocated by the government 2) too many agencies overlapped and 3) FEMA sets a plan and expects it to work while the military thinks in terms of preparing for when it doesn’t work. Also, I read elsewhere that fishermen were voluntarily picking up the stranded but were stopped because of regulations. This also happened after a tornado where people brought supplies to a church. The Red Cross seizes all the goods and threw out those that didn’t “qualify”. I believe it was the LA floods last year. The boaters were told that they had to take a full year emergency rescue course (with a $200 fee) and pass a “first responder” test or they would be jailed if they continued with their rescue operations. As a retired wildland firefighter, my home and yard is not complete and unsafe without sturdy shovels, pulaskis and other hand tools to remove the brush. Many of my tools are reclaimed Govt purchases that I put new handles on in the off season (winter). When the skies are smokey and the horizon is red, these same tools ride in the back of my truck. Once again, Fire season is here in the West (of the Rockies) so it is our own local version of SHTF every summer. I know lots of people here have wells and the means to get the water out of the well in a grid down scenario, however I had read that an earthquake can shear off your well pipe. So regardless of your level of preparedness, you should have some water stored on site. Another thing I had seen on the news some time ago. After a major water main break left one town without water for a day. When talking with the person in charge, he told the news crew that the system was aging and they expect to run into these situations more and more. I entirely agree that our infrastructure is decaying and is in worse shape than many know, and we will definitely be seeing more issues in the future. Governments don’t want to spend money on repairng-upgrading-replacing infrastructure, and when it gets worse it will cost even more… Good thing I don’t depend upon it 😉 Except for the roads – which are in pretty bad shape generally (I just drove across the country and back, and I saw it with my own eyes). I’ll bet that Washington-DC roads though are pristine…(just a sarcastic guess). Actually, Washington DC roads are in terrible condition! There’s so many people that there’s never time to close the roads for repair. Infrastructure spending is really fraught in the DC area because of corruption issues, so no one trusts that their money will be used wisely, and no one is willing to tell people that their commute is going to be doubled because of construction, so repairs are rarely made and are cheap patch jobs when they happen. In missouri, Medicaid spending has been going up at a one percent per year. Ten years ago it was about 23 percent of the budget, now its about 34 percent. Its not the only reason, but it is eating the funds for everything else. On the wells during an EQ, the failure will depend on the following. Was it drilled an by chance they hit water or did they hire an accredited dowser for the location before the drilling. Yes, it does matter. Dowsers when searching the property site or map dowsing, we have a list of perimeters that the well site must have, before it is selected, one is not caving in during an EQ. In the area we reside due to the earths composition the wells are not cased down to the bottom of the well most have about 20 feet of casing. Thanks for that info Antique Collector. I’m not sure how many pipes were used when our well was put in, but I do remember many. Although earthquakes are rare where I live, they still do happen. Some months back we received a notice that our water would be off for a day to fix some pipes. That turned into 3 days. Not a problem for me as I store about 100 gal in bottles and 5 gal jugs in the house and about 500 in 55 gal drums outside but it caused a lot of panic with some of the neighbors. Put into perspective for me how much water I would be using in a day also. That always scared the hell out of me when I was living in Co. One of the guys in our neighborhood showed me pictures of the Sugarloaf fire that had burnt out a bunch of people a couple years before we moved there. I cleared everything back from the hoysevand put a metal roof on it. FEMA came to ‘the rescue’ in Detroit about 15 years ago because their entire sewer system failed and most homes had sewer backup problems. Their infrastructure was old and failing and the City didn’t have the initiative to plan/update what they knew was failing. The homes did not have backflow valves installed. So along came a hard rain that lasted 2 days and the next thing that happenedd was sewer backups in the homes in Detroit. The area was declared as a Federal disaster, so FEMA came in and so did the free-money. All those people were awarded up to $26K for damages that were not from the storm but from the idiots in the Detroit City Council and the Mayor’s office who let their infrastructure get to the failed-point. Your tax dollars at work, yet again. We had cases of water scattered all over this place, now they are organized closer at hand so now know what we have in personal sized bottles. We use a lot of apple juice(gallon jugs)during fruit canning season, gallons of grape juice from Costco, Gatorade gallon size from Food Max. Those containers are washed-bleached rinsed filled with water and stored on shelving. One can make their own water filtration from two FGB’s and cartridge. There are instructional sites on ‘how to’ through U tube. Where one could create their own filtering units. In our case the buckets were free, and the filters cost was about $35.00 on Amazon. You can literally never have to much water. Our 100 year old laid stone well was down to six in above the foot valve with last year’s drought. I trucked water all summer and fall,(think the ducks used more than us). Well co finally showed up late in Dec.,finally got water but not happy with the quality. I went back to hauling water this spring and keep at least one 250gal tote at all times. Add to that the bottled water and family sized filter. Thankfully our old well is now fuller than I have ever seen it. Feel like I can breath a little easier but the ducks still use to much. If I read your posting correctly, your well did not refill as it had in past years. The well from the construction material you describe, it would have been established years ago. What I am gathered the main stream that originally fed the well diverted due to dry soils/collapsed and other bleeder stream took its place in filling in the well’s water. This is not uncommon, especially if the well was placed/dug on a “non live steam of water”. A live stream of water is one that does not go dry even during a drought. You may want to contact the “The American Society of Dowsers” for a dowser in your area that has been trained my a master to straighten out the water issue for you. No, I am not a member, with my schedule do not have time to devote to their society. I was trained by one of their two time winners for ‘Dowser of the Year Award’. Carl Bracy really a great guy & wonderful teacher, he is missed. Trying to explain what is happening to your well with a sick kitty on my lap & laptop..is not an easy feat. I like the half-cases of water, not so hard to move around. Some of those bottles are flimsy, so I also have a few 6-packs of Fiji water as their bottles have thicker plastic and would hold up better when reused, and it tastes good too. I write the purchase month and year right on top of the case with a marker, like “5/17”, which makes it easier to track and rotate. I’m absorbing so much from the many comments as a newbee to even modern survival. Starting up with purchase of several cases of water! We recently were told by our township that sewer improvements were being done in our neighborhood (non-invasive – pouring a pipe lining into old pipes) and our street couldn’t use any water on that day from 6a to 6p. Easy with forewarning but not so much on the fly. Thinking after the fact that we wouldn’t even have been able to flush. So much to learn and so much preparation to consider. We definitely take our lives for granted living in NJ with very little severe weather occurrences. I have a supply of low sodium vegetable juice, in individual servings and some large bottles. I rotate them and use them daily. The small cans are one vegetable serving per can. They can be used to supplement fresh veggies as well as in an emergency. I also purchase tetra packs of vegetable soup which I eat cold in the summer. Also canned tuna in water can be a good source of protein. I have to replenish my bottled water. I would even buy some large 1.5 litre bottles. Apart from a power failure my next concern is the city going into lockdown. People could be forbidden to leave their homes during a loose gunman episode of ordinary crime, or a terrorist event.